Flammable and combustible storage materials catch fire very easily because they are constantly releasing vapors into the atmosphere around them. All it takes is a spark to cause the vapors to burn. A fire of these volatile materials can easily get out of control as more and more vapors are released due to the heat. Under the right conditions, and without proper flammable storage in place, the material can explode leading to significant injuries and damage. In August 2017, a paint and body shop in Ashland, OR, was fortunate not to experience more severe consequences when static electricity ignited an oily rag, and the flames spread quickly to flammable paints nearby. Though no injuries were reported, the shop’s building and equipment suffered an estimated $100,000 worth of damage. Flammable and combustible storage buildings are recommended to comply with OSHA and NFPA regulations and to keep personnel safe from similar situations. What is the difference between flammable and combustible liquids and does this affect storage? There are two main codes that define categories of flammable and combustible storage materials and they differ slightly from each other. It is important to know the specific compliance requirements for your application and location. Expert advice on fire rated, flammable and combustible storage options can help your company stay compliant and avoid fines and penalties. Both OSHA and the fire codes define flammable liquids by their flash point. 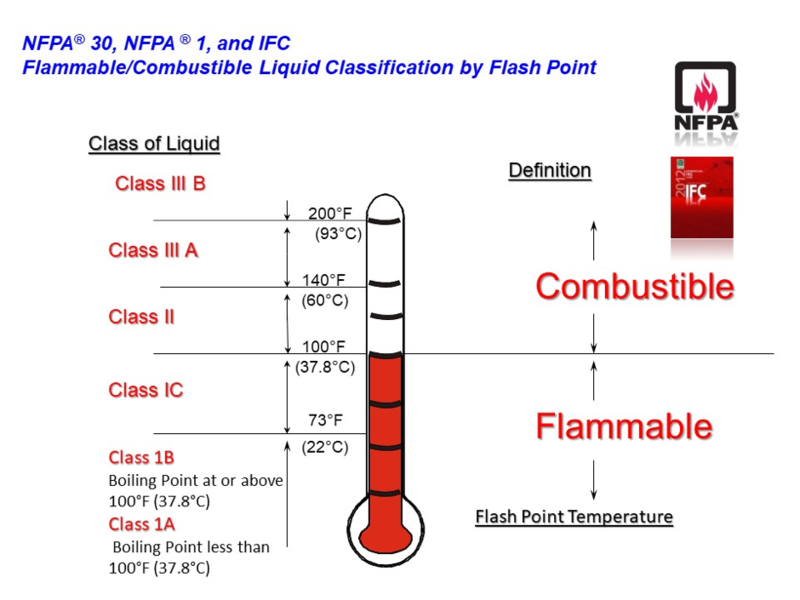 Only the NFPA 30 – Flammable and Combustible Liquids Code, NFPA 1 – Fire Code, and IFC – International Fire Codes differentiate a flammable liquid vs. a combustible liquid. 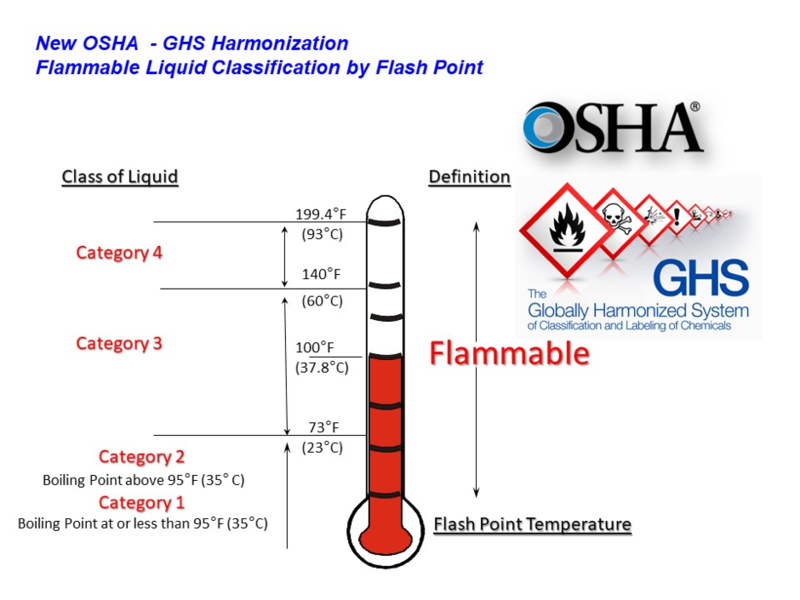 A flammable liquid is any liquid with a flash point less than 100°F and a combustible liquid is any liquid that has a flash point at or above 100°F. As can be seen from the paint and body shop incident above, the purpose of safe storage practices for flammable and combustible liquids is to keep them away from potential sources of ignition. Regulations also determine the maximum quantities of the different class materials, which may be kept in close proximity to or inside occupied buildings. U.S. Chemical Storage supplies storage lockers which are built with heavy gauge steel and can be selected with a 2-hour or 4-hour fire rating. 2-hour fire-rated FIREloc chemical storage lockers are designed for flammable and combustible storage of materials between 10 and 30 feet from occupied buildings. 4-hour fire-rated SUPERloc chemical storage lockers can safely house these materials within 10 feet of an occupied building, or even inside another building. Contact U.S. Chemical Storage to learn more about flammable and combustible storage for dangerous materials or to receive a complimentary quote. Our professional consultants can advise you on the best flammable storage solution for your application as well as the regulatory requirements that are relevant to your industry.